This echoes what author Stephen King once said, “Talent is cheaper than table salt. What separates the talented individual from the successful one is a lot of hard work.” McQuade reminds us that talent, precious as it is, is never enough. Talent may be a given, but it must be re-earned, every time. Ignoring what’s out there, beyond one’s discipline, limits you to one lens of a world, endowed with so many dimensions. McQuade strongly encourages wanderlust. 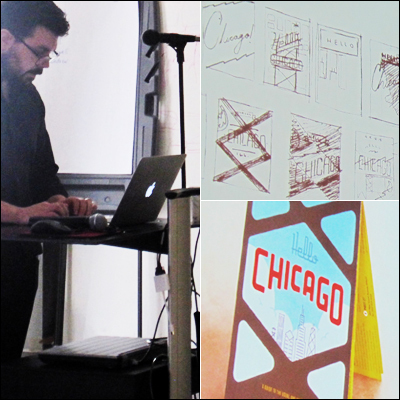 One example: a vintage sign influenced how he redesigned the cover of his illustrated map of Chicago for Herb Lester Associates. Furthermore, in contrast to his former work schedule, McQuade’s work-in-progress schedule—with time assigned to “Personal Work & Learning”—is bent on accommodating creative exploration and diversifying it. Get your work out of yourself and out there into the world, to be potentially cherished, critiqued and forwarded. As McQuade concluded: keep doing the work, keep up the humility, keep encouraging the possibility of piquing someone’s discovery of what you love to do. When you make, opportunities can then be made. Considering his seize-it-and-mean-it attitude, I feel that McQuade would don this gracefully blunt t-shirt by wordboner. Big thanks to: Gensler for hosting, Artisan Talent for sponsoring Chicago CreativeMornings #9, organizer Mig Reyes, videographer Craig Shimala, photographer Chris Gallevo, for their great work on making CreativeMornings happen in Chicago. 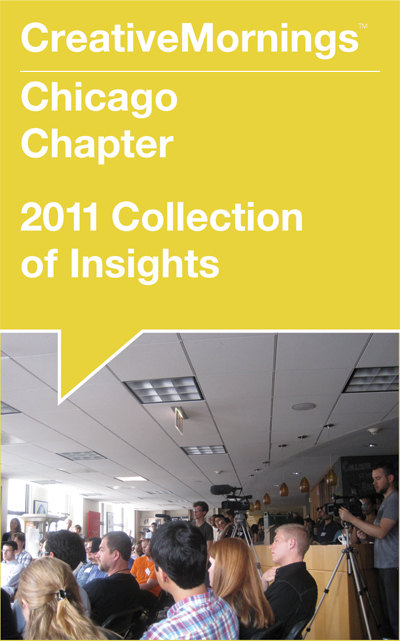 2011 was Chicago CreativeMornings’ debut year. Download the entire collection of selected insights and read more Chicago CreativeMornings coverage.